Beat the holiday traffic as there will be no need to travel out of the Metro this Holy Week! Without the hassle of going to faraway places, you could have a luxurious vacation to refresh and rejuvenate plus more time to have fun! Read our list to see why Holy Week is spent best in a 5-star hotel in Metro Manila. I’M Hotel, located along the corner of Makati and Kalayaan Avenue is hosting its Easter Party on April 21st. The Grand Narra Ballroom will be transformed into a haven of excitement and fun. For just P2000 Nett per adult, and 1,200 for children 12 and below, participants will be treated to tons of food, freebies, and activities. The Easter program includes an extensive premium buffet spread, face painting, nail and towel art, magic acts, and live circus acts! They are also debuting a larger than life candy house filled to the brim with candies and snacks for the kids to grab! Parents stand to win I’M Hotel, Antidote Rooftop Bar and I’M Onsen Spa raffle prizes. Entrance will be free for children aged 2 and below, as long as they are accompanied by their parents or guardians. For more information, visit www.imhotel.com. To book and secure your Easter tickets, please email reservations@imhotel.com or call +63 2 7557 888. Book an all-inclusive spa package at the number 1 spa in Manila on Tripadvisor for only Php 1950 nett! I’M Onsen Spa, the country’s largest urban spa with the first “onsen”, offers the right combination of nourishment for mind, body and soul. An I’M Onsen Spa experience comes with access to our spacious relaxation lounge with free-flowing complimentary herbal teas, and includes a wholesome buffet along with your treatment of choice. Guests are highly recommended to opt for our all-inclusive spa package which includes a buffet at The Common Good, a food playground with 9 dining stations and a mouth-watering array of novel international delights. Buffet hours are from 4 pm-10 pm daily and all-inclusive spa packages start at only Php 1,950 nett. Guests who wish to have spa treatments without a buffet can also opt for a la carte spa packages from Php 1,550 nett only when they visit the spa from opening time till 4pm daily. I’M Onsen Spa is open daily from 12nn until 2am on weekdays, Monday – Thursday, and from 10am until 3am on weekends, Friday – Sunday, and holidays. For those seeking a total experience at I’M Hotel, an Eastercation is imperative. 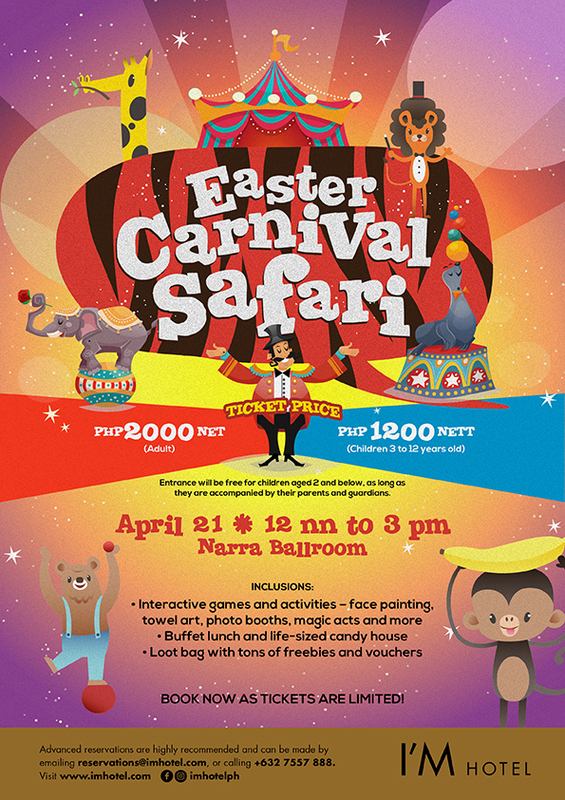 For a room bundled with 2 adult tickets (or 1 adult and 2 child tickets) to Easter Carnival Safari event, rates start at only 8,400 nett (4 tickets for 2 adults and 2 children will come bundled for 2-bedroom suite bookings). For those who wish to avail their stay before Easter itself and join the event on April 21, they are also welcome to do so. Entrance will be free for children aged 2 and below, as long as they are accompanied by their parents or guardians. This promotion can be availed by emailing reservations@imhotel.com, quoting Eastercation Package. Guests may opt for a wellness getaway with our Spa-cation promo. Overnight package rate starts at only P8980 nett inclusive of buffet breakfast, use of swimming pool and gym facilities plus 60-min choice of Aromassage or Shiatsu massage, free-flowing herbal teas, access to wellness suites – onsen, steam and sauna, and buffet dinner for 2 persons. Take advantage of the best available rates online at www.imhotel.com starting at 6,300 nett with buffet breakfast for 2. Found lower rates elsewhere? I’M Hotel offers Best Rate Guarantee, which means they match the prices you may find on other online platforms or agencies. Complimentary benefits also await, such as complimentary early check-in or late check-out, subject to availability, and access to Club Lounge. A nominee of the 2017 and 2018 Asia Spa Awards for Best Urban Hotel in Asia, I’M Hotel is a property of many firsts. 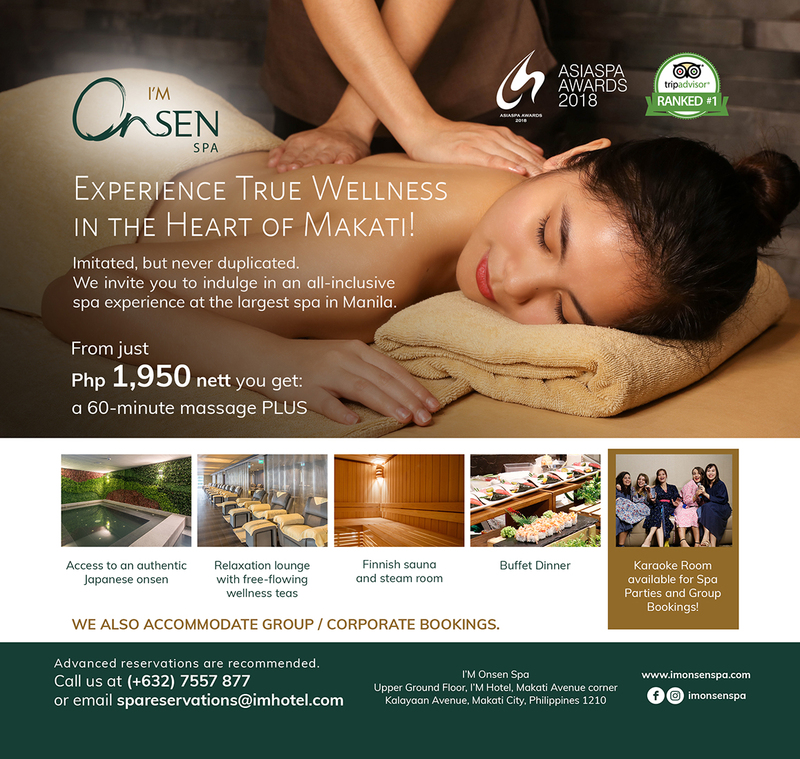 It is the first 5 star hotel in the Poblacion district of Makati and houses the first Onsen Spa in the Philippines, I’M Onsen Spa, which is incidentally the largest urban spa property in the country as well. It is exceptionally located with close proximity to malls, entertainment centres, and a mere 800m away from the Makati CBD. Another unique feature of the property is Antidote, the country’s first jellyfish rooftop bar offering magnificent cocktails crafted in collaboration with Bar Mace–one of the World’s Best 50 Bars.